As families prepare to head back to school, it is important to familiarize parents and children with some potentially lifesaving safety tips. Buses and bicycles are two of the most commonly used forms of transportation amongst children commuting to and from school. 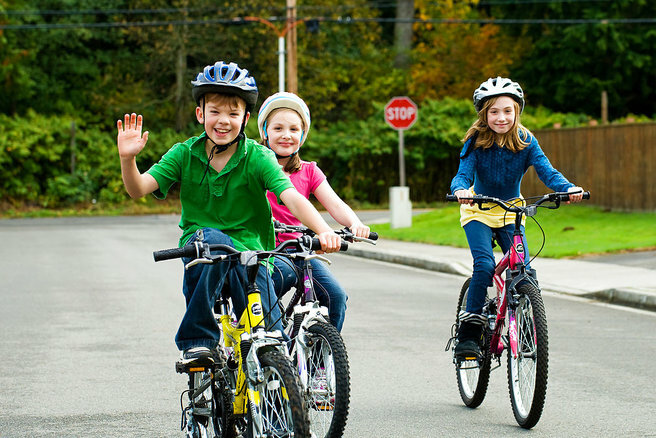 Dr. David Arai, emergency medicine physician on the medical staff at Centennial Medical Center in Frisco, Texas, answers some questions about back-to-school bike and bus safety. Q: What are some of the most common injuries seen in bike-related accidents? We see a significant amount of internal injuries, like bleeding from the liver or other internal organs and ruptured spleens. Since children and teenagers have enlarged spleens in general, the risk of damage to this organ is greater. Head injuries and broken bones are common as well, and if a bone such as a rib is broken, children run the risk of puncturing a lung. Q: What factors contribute to the severity of bike injuries? If the bike is moving at a speed greater than 30 mph, the injuries are usually very serious and extensive. However, serious injuries, including internal bleeding, can happen even if someone falls from a bike at a standstill. Wearing protective gear like pads and a helmet is important for riders of all ages. Q: Do helmets really prevent the risk of injury to a rider’s head? A helmet plays a huge role in minimizing injury or brain trauma for the rider – a helmet can often be the difference between life and death. It’s important to have every means of protection possible, especially guarding your brain, the “control center” of your body. Taking the time to adjust your helmet properly so it fits correctly is important too. Straps should form a “V” underneath each earlobe and no more than one finger’s width should fit beneath the strap. The helmet should be worn level and cover the forehead, with the rim resting approximately one to two fingers width above the eyebrows. Never wear a hat under the helmet. Q: Is it necessary for bikers to adhere to traffic laws? Bikes are moving vehicles and as such, need to obey traffic safety rules. Parents should take care to ensure children make themselves noticeable by wearing bright clothing, reflectors and lights at night when riding a bike. Go with the flow of traffic, and look both ways before crossing a busy street. Stop at all stop signs, cross at intersections, yield to pedestrians or traffic when appropriate and use correct hand signals while turning or changing lanes. Also, make sure not to ride too close to parked cars in case a door opens unexpectedly. Q: What immediate action should be taken if an accident occurs? If you have pain, go to the emergency room right away. Waiting for pain to subside or self-diagnosing can be life-threatening, especially if you have internal injuries which are hard to detect. Q: Each year, roughly 25 children are killed in school bus crashes or while getting on or off the bus. What are some precautions parents need to teach their kids to ensure safety while traveling in buses to and from school? Most of these children are between the ages of five and seven and probably haven’t been taught the proper safety measures. As the bus approaches, children should stand approximately six feet away from the curb and line up away from the street. Wait until the bus comes to a complete stop to approach it. Also, it is important that kids listen to the driver and are seated whenever the vehicle is moving. Q: What specific tips do children need to know before entering and exiting a bus? Children should always get on and off the bus at safe, designated locations. When boarding or exiting a bus, children should use handrails to avoid falls and make sure no backpack strap or loose item of clothing such as a drawstring gets caught in a handrail or door. If children drop something when exiting a bus, they should not stop to pick it up because the bus driver may not see them.